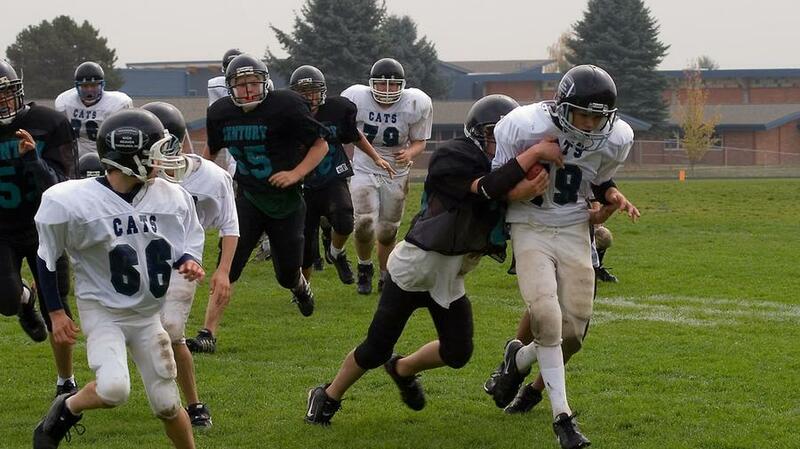 A new Pop Warner lawsuit raises hard questions about how we regulate youth tackle football. To understand what a new potential class action lawsuit filed last week against Pop Warner and other youth football-related organizations over brain damage could mean for the future of the sport, start with helmets. No, not those helmets. Not the heavy, foam-filled, hard plastic shells America is strapping onto the heads of its eight-year-olds before sending them out to hit and tackle one another, just like they do in the National Football League. Think novelty toy helmets. The kind you give a child to play with, not in, and that maybe end up on a shelf in the kitchen, flipped over and filled with candy. Earlier this year, sports safety advocate and litigation consultant Kimberly Archie spent a day on Capitol Hill, lobbying Congress about brain injuries. During a meeting with House committee staffers, she produced two football helmets. One was a toy. The other was real, like the one worn by her son, Paul Bright Jr., who played eight years of Pop Warner football, later suffered mood and behavior problems, died in a motorcycle accident at age 24, and subsequently was diagnosed with Chronic Traumatic Encephalopathy (CTE), a neurodegenerative disease linked to repetitive head trauma and found in the brains of many deceased football players. The design of the toy helmet, Archie explained, was subject to series of federal safety regulations intended to shield children under age 12 from harm: minimal levels of lead, because lead can be toxic; no particularly small parts, because kids can swallow them and choke. Commonsense protections, too often born from preventable tragedy. Meanwhile, the real helmet was subject to safety standards set by the National Operating Committee on Standards for Athletic Equipment (NOCSAE), a nonprofit funded by the sporting goods industry. Problem was, NOCSAE's rules only covered adult helmets, not youth models, even though scientific evidence suggests that biological differences between adults and children make the latter uniquely vulnerable to brain injury. "I would tell them, 'We're going to play with one helmet, and with the other, we're going to put it on your kids' heads and go do mini car crashes,'" Archie says. "Everyone just looked at me and didn't know what to say. It doesn't make sense." Archie could end up changing that. Along with another mother, Jo Cornell, whose son also played Pop Warner, suffered behavior problems, took his own life, and was posthumously diagnosed with CTE, Archie is a named plaintiff on the new lawsuit, which argues that Pop Warner, NOCSAE, and USA Football (the sport's national youth governing body, funded by the NFL) irresponsibly exposed children to both brain damage and increased risk of such. Beyond its specific legal arguments, the suit raises a larger question: Should society view and regulate youth tackle football and its equipment through a lens of child protection like novelty helmets, or continue to take the largely hands-off approach we traditionally have reserved for sports? Filed in U.S. District Court in California by Los Angeles–based trial lawyer Tom Girardi—one of the real-life Erin Brockovich attorneys—the suit seeks to represent every current and former Pop Warner player since 1997 and contends that Pop Warner, NOCSAE, and USA Football failed to uphold their duties to provide for the safety and health of child athletes, some as young as five years old. It additionally asserts that all three organizations misled and deceived parents and children about youth football's brain damage risks. * Pop Warner deceivingly advertised itself as a "safety-first organization in which children play for coaches trained in proper tackling techniques," including a "Heads Up" coaching program developed and promoted by USA Football and the NFL. Both USA Football and Pop Warner touted preliminary, non-peer-reviewed research showing that Heads Up reduced concussion and injury risk among youth players—even though that claim subsequently was found to be overstated and inflated. * Pop Warner claimed that its volunteers and coaches were extensively trained, but in a deposition given by executive director Jon Butler in a separate brain injury case, he admitted that the national Pop Warner office does not check whether coaches receive such training, and that his organization does not employ personnel with "a medical background, athletic training background, or physical education background." * Pop Warner failed to ensure that children were using the safest possible helmets, instead deferring to NOCASE, which as previously mentioned does not have a youth-specific helmet standard. "If your kid is at the public pool during the summer, the lifeguard has to have appropriate training, because people can drown," Archie says. "It's a much higher standard than youth football. Frankly, a nail technician has more regulation to do fake nails." Archie describes her son, Paul, as a sweet young man who loved his job as a Hollywood set caterer. She told the Los Angeles Times that she was somewhat surprised by his CTE diagnosis, given that he only played Pop Warner and a year of high school football. Given her knowledge of traumatic brain injury, however, she can look back and see how the disease—which, in his case, was in an early stage—was affecting his behavior and judgment. Archie knows that litigation can't possibly make up for his absence, nor for the pain it has caused her family. Still, she hopes that a successful case can keep other families from going through the same thing, in part by holding Pop Warner, USA Football and NOCSAE accountable for what the lawsuit asserts are their ongoing failings to protect children, and in part by asking the rest of us to reconsider the way we think about safety and responsibility in youth football. Historically, Americans have granted youth sports—even violent-collision sports—tremendous latitude. You can answer to Child Protective Services for letting your children walk alone in your neighborhood, but not for dropping them off at a boxing gym, or enrolling them in a MMA clinic, or allowing them to bash helmets on the line of scrimmage. The prevailing legal and cultural attitude is that sports can be dangerous, sure, but they're also good, and the benefits outweigh the risks—so let's not discourage or prevent participation through regulatory oversight or added costs. Last October, for example, an Illinois state judge dismissed a brain damage lawsuit brought by football players against the state's high school sports association, writing that "imposing broader liability on this defendant would certainly change the sport of football and potentially harm it or cause it to be abandoned." In other words, making football organizers more responsible for the harm it can cause to minors could also make the sport too expensive and/or litigious to play. However, increased understanding and awareness of brain trauma has begun to change this calculus. Marked by declining participation, an embarrassingly violent (if somewhat popular!) reality TV show, and growing public sentiment that children shouldn't be hitting each other in the head, youth football has drawn the attention of lawmakers. Members of Congress have proposed federal equipment oversight by the Consumer Products Safety Commission and Federal Trade Commission, while every state and the District of Columbia has passed youth sports concussion legislation that typically requires (a) basic concussion-recognition training for coaches and (b) that athletes suspected of suffering concussions be removed from play and not returned without medical clearance. Nevertheless, Archie says, more can and should be done. "California just moved [the legal age to purchase] cigarettes up to age 21," she says. "But you can be five years old, weight 45 pounds, get out of your car seat—a car seat that has to meet certain requirements by law—and go do mini car crashes in football with a phony helmet that isn't made for children. Really?" Three years ago, Pop Warner became the first youth football organization to limit contact in practice, to a maximum of one-third of practice time. It also forbids full-speed, head-on blocking and tackling drills in which players line up more than three yards apart, and requires any player who suffers a potential head injury to be examined by a medical professional trained in concussions before returning to play. Is that enough? The lawsuit filed by Archie and Cornell asks for a judicial order imposing additional measures: warning labels on all helmets disclosing the risk of exposure to CTE and other neurological damage and disease, and the development of an actual helmet safety standard by NOCSAE specifically for minors. Taken together, the new requirements would essentially force players, parents, and the youth football industry to further acknowledge two disquieting things: that the sport can be harmful to the brain the way boxing is harmful to the brain, even for its youngest participants, and that those same participants are uniquely at risk. The last part is key, both to the Pop Warner case and to the bigger picture. Unlike, say, the class action concussion lawsuit brought by former NFL players against the league, Archie and Cornell's suit doesn't deal with the responsibilities of employers to grown men being paid to do a dangerous job. It deals with children. And society treats children differently. Children can't smoke. Can't buy beer. Can't join the military. Can't even obtain a driver's license until they are age 16 or older in most states. All of these activities are deemed too risky for minors not only because they are potentially harmful, but also because we don't trust children to make sound, informed decisions about their own well-being. As the suit states, California law requires adults to exercise a greater degree of care when it comes to child safety, because children lack the capacity to "appreciate risks and avoid danger." Back to youth football. The adults running organizations like USA Football and NOCSAE have that capacity. Are they exercising it in a reasonable, responsible manner? Are they focused on protecting children, or protecting a game? What happens if they can't do both—if there is no acceptable level of football-induced brain damage risk for minors—and society has to choose? The new Pop Warner suit has the potential to clarify those questions, but ultimately it won't be able to answer them. That's up to us, and how we feel about the difference between Archie's two helmets. "I can remember in the 1970s, you would see kids piled in the back of a pickup truck, speeding down the highway," she says. "You would never see that today. We know better. But in youth sports, we are still driving 70 miles per hour with the kids in the back of the truck. We need to fix that. America loves sports, but we need to even the playing field and love kids just as much."